Refrigeration is an essential food storage technique, which brings down the reproduction rate of bacteria by lowering temperature in a confined space, and in turn reducing the rate of food spoilage. A refrigerator (colloquially fridge) is a common household appliance that consists of a thermally insulated compartment and a heat pump that transfers heat from the interior of the fridge to the exterior, so that the inside is cooled to a temperature below the ambient temperature. Much of India’s population falls into the below poverty line category who cannot afford to have basic household appliances. So a simple appliance like a fridge is out of the reach for many such households. Further, a fridge does consume a lot of power, accounting for as much as one-fifth power of a household’s annual electricity costs. In 2001, Gujarat was hit by a devastating earthquake that ruined hundreds of thousands of lives. Those families that were fortunate enough to survive, lost most of their possessions in the quake, including kitchen appliances. Mansukhlal Raghavjibhai Prajapati, a modest clay craftsman in rural India spent much time in the disaster zone in Gujarat as a relief worker after the earthquake. He took note that many families were without fresh food and water. 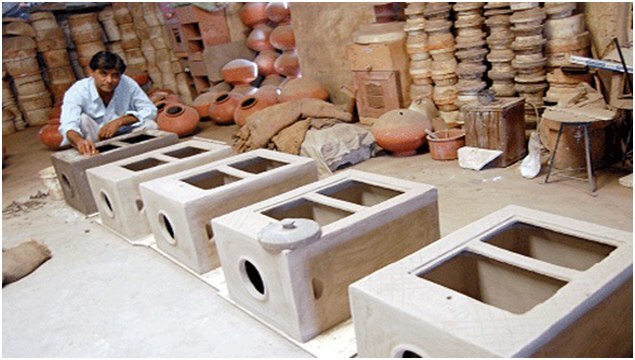 To fulfill this need, Prajapati designed a cheap clay refrigerator for the rural population that does not require electricity to keep food fresh. His idea “Mitticool” harnesses water’s ability to remove heat through evaporation. This is very much similar to the earthenware-based “Food Preservator” used in ancient times. The Mitticool refrigerator requires no maintenance other than basic cleaning. It also helps reduce electricity bills, saving many rural families a substantial sum of money. Mansukhlal Prajapati produces Mitticool in a tiny village near Rajkot in rural Gujarat. Mitticool is made of clay, which utilizes the age old principle of ‘Surahi’ i.e. ‘cooling through evaporation’. The topmost section holds water, which very slowly drips down the sides. As the water evaporates from the porous clay surface, it cools the interior, enabling you to store fruit, vegetables, milk and other food items. There is a small faucet tap on the front lower end of the unit, so it doubles as a water cooler as well. 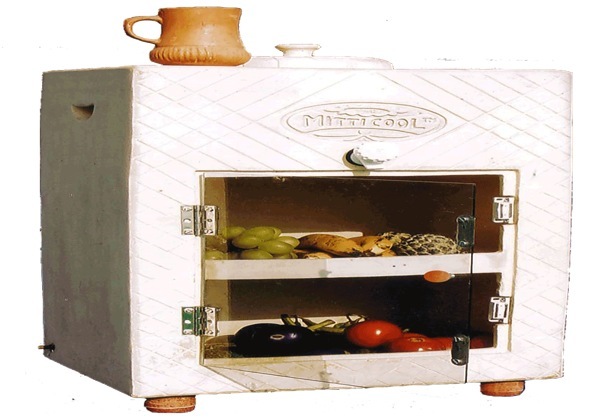 This refrigerator can maintain vegetables fresh for 4-5 days and it can also keep milk and buttermilk fresh for 24 hours. Further, it keeps the original taste of food intact. When using first time, Mitticool takes about 12 hours to bring in the cooling effect. It is durable in nature and need not to be replaced after using for some period (like a clay pot). However, Mitticool needs to be kept in a proper ventilated place to allow better evaporation, which in turn enhances its performance. The outer body of the fridge has to be cleaned at an interval of 2-3 days to keep the pores of body open. Preserves the original taste of the fruits and vegetables, which can be stored fresh without deteriorating the quality for 2-3 days. Mitticool’s performance is totally dependent on external temperature and humidity. It performs well in dry and hot climate. So it will not function everywhere, as evaporative cooling only works well in dry climates. It will break if it falls from a height as it is made up of baked clay. Mitticool is an ingenious innovation for the bottom of the pyramid market where, electronic devices have slowly started to penetrate the market. Implementing green ideas at the rural level is equally important as it is imperative for us to reduce our carbon footprint at all strata. In addition to the Mitticool fridge, Mansukhlal Prajapati also sells a variety of other clay-made products that are affordable to the poor. Apart from selling over 3,500 refrigerators so far, he sells around 50 refrigerators, 500 clay water filters, 500 pressure cookers, and 1,000 frying pans a month. Over the last five years, the only major complaint he says he had was that the magnet on the fridge door gave way. He has orders from all over the world and has been a recipient of many awards. He has received ISO certification and his frying pans have been approved as having a food grade quality coating. His future plans include starting a factory with the aid of the National Innovation Foundation at IIM Ahmedabad and making a MittiCool house! well this will reduce carbonfootprint for sure. Where can I buy one, or are there plans somewhere that tells how to build one? I’m going to be living off-grid, and this would be perfect for what I need. At present it is available in Gujarat and areas of Maharashtra where there is tribal area on borders of Gujarat. I brought a water bottle of same mitticool which can store one litre of water. It cools the liquid within 20 minutes after filling. Initially you will not like it because it provides only 800 ml of water to use as rest evaporate to cooling function. It is best in remote areas where there is no electricity. thank you very much for such accurate details of your usage. Yes, water storage capacity is pretty low in Mitticool but it has been built for cooling food items mainly. Hi Lawrence. Here I have not commented on the fridge of mitticool but on one of its product water bottle, which I have used personally. I have not used mitticool fridge. I also appreciate the work done on this innovative idea but people living in remote areas where there is no electricity or they’re unable to bear the cost of electricity, for them it is blessing. You can use the water bottle if you are trekking because you can get cool water within twenty minutes of filling. I carry this bottle while traveling so that I can get cool water available.